We were sent the LeapFrog scribble and write to review from LeapFrog. It's an electronic writing pad to aid children in learning to write letters and numbers as part of their Communication, Language and Literacy development. Liam has had a lot of fun tracing over the lights to draw simple shapes and pictures. The fun learning games will hopefully help to reinforce letter recognition and pencil control skills without him knowing it!. 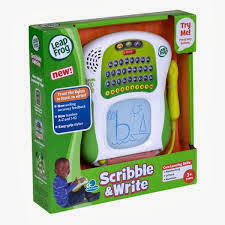 LeapFrog's Scribble and Write is a great sized toy, it's just big enough for Liam and children in general to use but not too big its going to be great for taking out and about. Not only can your children write and draw but they can interact and learn to count too. When you draw certain numbers, the scribble and write will ask the child to clap up to the value of the number, which is another fantastic feature. 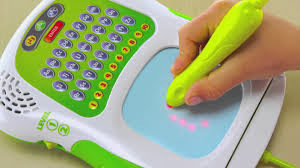 The Scribble and Write is so easy to use, children can simply draw on the interactive screen with the attached pen and then swipe the button at the bottom across to clear it and start again. The pen cleverly clips neatly into the back when you have finished learning and want to pop it away. The good news: the Leapfrog Scribble and Write already has batteries so it’s good to go! This is fantastic because nothing is more annoying than getting a toy for a child and realising too late that there are no batteries in the house to get the toy to work. Overall we're really enjoying the Scribble & Write and would recommend it as a great educational gift for a child this Christmas.